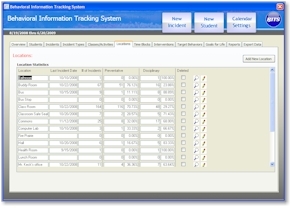 The BITS Behavioral Management System allows you to track student behavior by physical location. This is different from tracking by class or activity because you can analyze patterns of behavior based on exactly where a student is when behavior becomes an issue. As with most of the data tracked by BITS, you can see patterns emerge for each student and for your entire group of students. This is the name that you give a specific location. This can be a specific term such as Classroom, or a general term such as Inside. 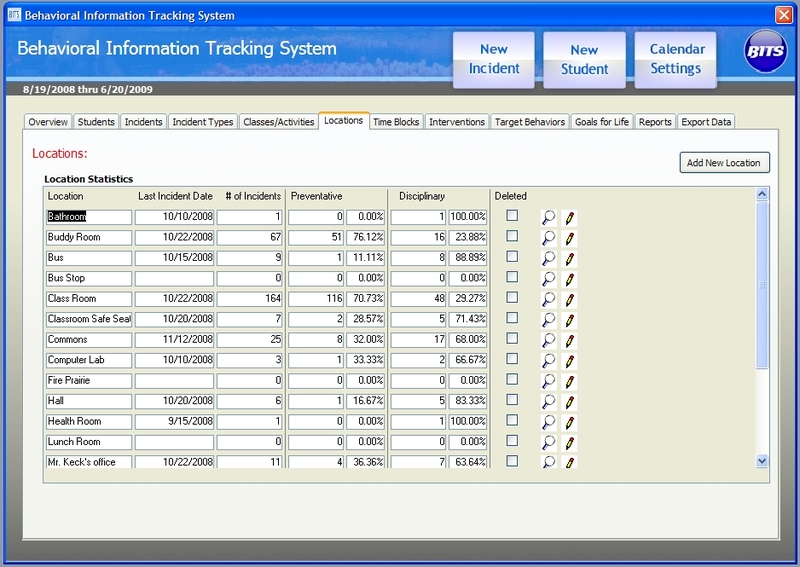 You can set up as many locations as you need to track behavior more effectively. This is the date of the last recorded incident for this location. You can create new behavioral incidents in the Incidents Tab or by clicking on the "Create New Incident" button at the top of the program screen. The Preventative column summarizes the count and percent of total incidents that are considered Preventative. The higher the percentage of Preventative behavioral incidents, the more in control students are likely to be in the location. The Disciplinary column summarizes the count and percent of total incidents that are considered Disciplinary. The higher the percent of incidents are Disciplinary the more likely it is that the location is prone to disciplinary behavioral incidents. A high reading in this column may indicate that the location could use additional resources, or that certain students need to be seperated in this location.